When ready to cook, start Traeger grill according to grill instructions, and set the temperature to 225 degrees F (set to Super Smoke mode if using a WiFIRE-enabled grill). 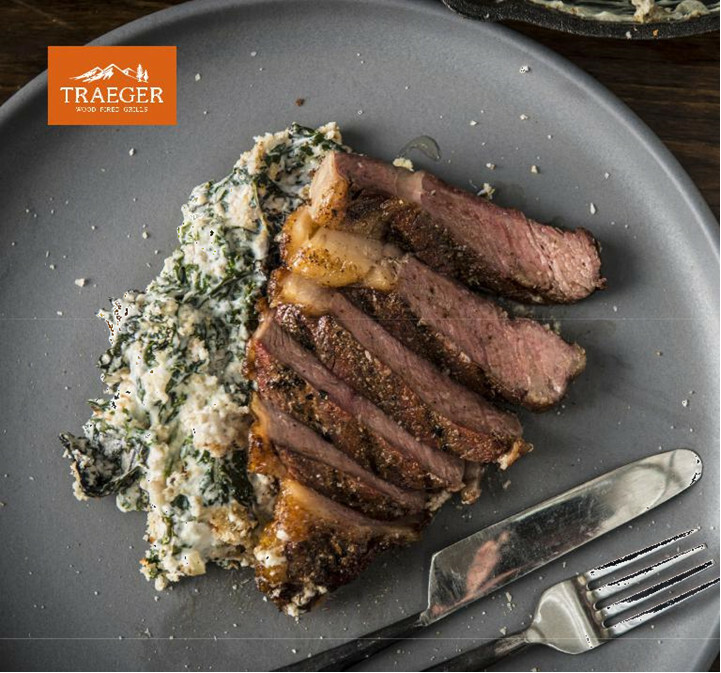 Season steaks generously with Traeger Coffee Rub and place directly on the grill grate. Cook for 30 minutes or until internal temperature reaches 120 degrees F. Remove from grill and set aside. While steaks are cooking, bring a large pot of salted water to a boil and blanch and shock the greens. Set aside. Heat butter in a medium sauté pan over medium-high heat. Add garlic and shallots and sauté until translucent and fragrant. Add flour and cook stirring constantly for about a minute. a boil and add in greens and nutmeg. Season with salt and pepper and transfer to a medium cast iron pan. Top with panko and parmesan cheese and set aside until steaks are removed from the grill. Increase the grill temperature to 350 degrees F and place the cast iron with the greens on the grill. Bake for 30 minutes or until greens are tender and sauce is bubbling. Remove from grill and set aside. Increase grill temperature to 450 degrees F (500 degrees F if using a WiFIRE-enabled grill) and preheat, lid closed for 10-15 minutes. Place steaks directly on the grill grate and cook for 3-5 minutes on each side to desired internal temperature, 130-135 degrees F for medium-rare. Remove steaks from the grill and let rest 5 minutes before slicing. Serve with creamed greens. Enjoy!